Add a pop of color to your campus #OOTD! T-shirts for school don’t have to be bland and boring. These campus fashion staples can be paired with virtually anything in your wardrobe for some insta-chic looks. The tees you rock can also show a bit of your personality, and if you’re on the hunt for new cute tops that are perfect for you AND for school, we’ve got a treat for you! If you love trekking or exploring (and love to marvel at nature's wonders), you’ll certainly find inspo in the magic hour design of this basic black tee. It's easy to mix and match, too. Just throw on some layers for rainy days, or simply wear the top with a pencil skirt or your favorite boyfriend jeans if it's a bit warmer outside. Does this design by Anissa Gomez totally get you? Vote for it here. If you're super girly, this trendy take on the graphic tee is a must-have for your closet. Equally fun and flirty, it's pefrect for pairing with jeans or dip dye shorts. Want to add some sass? Accessorize with your favorite ankle boots! Already imagining your OOTDs with Candleray Toreverde's design? Vote for it here. For that skater girl edge, try sporting this eye-popping tee with ripped jeans and white sneakers. Does Mia Del Mundo's design tickle your fashion tastebuds? Vote for it here. The athleisure trend is a foolproof way of dressing for comfort without sacrificing on style. If you're a varsity team member or if you strut your stuff for the school dance troupe, this graphic tee is perfect for your ultra-comfy joggers and high-cut sneakers. Is Leonard Agustin's shirt your next wardrobe staple? Vote for it here. The featured HaNIPS fashion designers were the top four semi-finalists picked by Jack ‘n Jill NIPS in collaboration with the SoFA Design Institute. 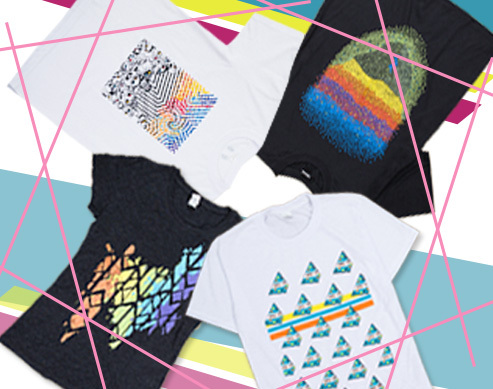 Click here to know more about the contest, and don't forget to vote for your favorite tee!